A brilliant alternative to chocolate, this fabulous Easter set includes the peep-through board book Egg and a gorgeously soft white bunny. 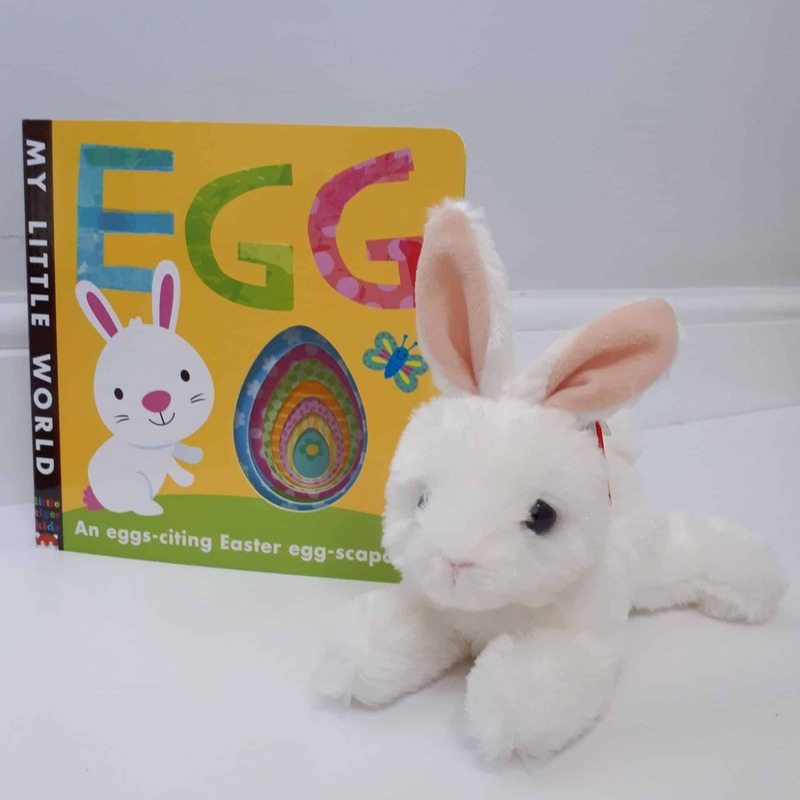 Join bouncy bunny and her friends in this exciting Easter egg hunt from Little Tiger Press. Bright artwork, finger holes and a cheerful rhyming story makes this a perfect book to share with 0-3 year olds. This cute, cuddly bunny is a great accompaniment to the story. Little bunny is 20cm long and suitable from birth. This set is available at the fabulously low price of just £10. Choose gift wrap at the checkout and I’ll wrap it and include a personalised note from you too. This set is available at the fabulously low price of just £12.95 delivered. A newly hatched caterpillar eats his way through all kinds of food. 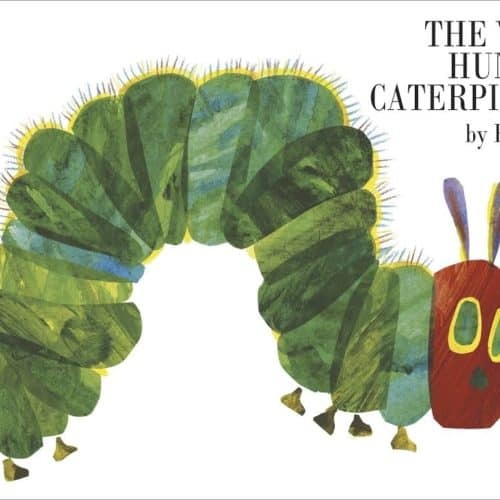 A classic book that has stood the test of time. 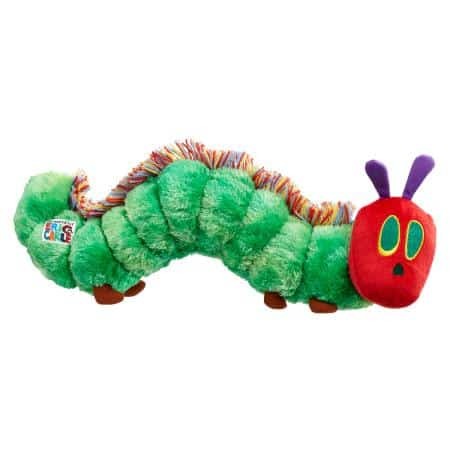 Be taken back to your own childhood with this cuddly, large Very Hungry Caterpillar soft toy. Suitable from birth, it’s a colourful addition to any nursery and will help bring the book to life for your little person. Buy him for your own baby or as a new baby or Christening gift for a friend. It measures 42cm from top to tail. Oh help, oh no, it’s a Gruffalo! Introduce a little one to this hugely popular story with this fabulous gift set. 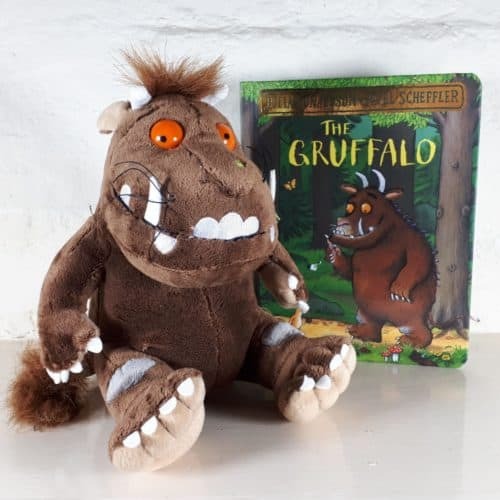 This set comes complete with a medium, 9” (23cm) Gruffalo and either a board book or paperback version of the story. If you’ve read the book, Gruffalo looks just as you would expect him to. He’s been sewn from a mix of velvet smooth plushes, primarily in brown with grey (knobbly knees), peach and white (curved horns) accents, with a fluffier pile for his head tuft and tail tip, plus white wool felt for his razor sharp claws, teeth, tusks, sharp pointed, purple back prickles and slimy black tongue.